Halloween is rapidly approaching, which means candy is coming!! Lots and lots of candy. Allll the candy. Our kids may eat a little differently than some, but that doesn’t mean that they don’t LOVE candy. I mean, who honestly doesn’t like candy? Arguably the best part of Halloween is trick-or-treating to get all.the.candy. It’s a literal dream-come-true for kids. You get to dress up in a fun costume and go house-to-house where people give you free candy. I mean, that’s probably my dream-come-true too. Unfortunately, though, most candy on the market is still full of fake dyes/flavors/preservatives, so for kids who don’t eat that stuff, it can be a major bummer. Enter the Halloween goodie bag. Every Halloween since we’ve been dye-free, I put together a yummy goodie bag of treats for the kids. We do the normal trick-or-treating, because it’s so fun for them, and then when we get home we go through all of their candy and pick out the (very few) things they can actually have (poor Isaac can get the least, because he’s allergic to dairy so most chocolate candy is out even if it’s fake-stuff-free). We put all of the stuff they can’t have in a bag to take to Aaron’s work, and they get their Halloween goodie bags full of yummy treats just for them. Some of the treats I put in their bags: YumEarth organic candy corn or Brach’s new “naturally sourced” candy corn, YumEarth organic gummy fruits in Halloween shapes (Black Forest Organics has some too! ), Wholesome Organic Halloween Lollipops (cheaper than YumEarth’s lollipops), and Sensible Portion’s Garden Veggie Ghosts & Bats (my kids love these!). For chocolate candies, I’ll sometimes throw in either a Justin’s peanut butter cup pack, or our King Soopers has Simple Truth bulk natural m&m-type candies (Trader Joes has delicious natural “m&ms” too!). These are all products that we have bought and enjoyed, and even better can buy in-store, not just online. We’ve found all of the above at our local Target. (Please note, if you’re following the Feingold Diet, some of these won’t be Stage 1 approved, particularly the fruit-flavored treats). You can also find a lot of clean candy at Whole Foods, which has a policy of not selling anything containing artificial dyes/flavors/preservatives. If you shop at Sprouts, make sure to check the labels on stuff; their bulk candy corn is artificial! Seek out houses in your area with Teal/Blue Pumpkins (and consider BEING a Teal Pumpkin House!!). 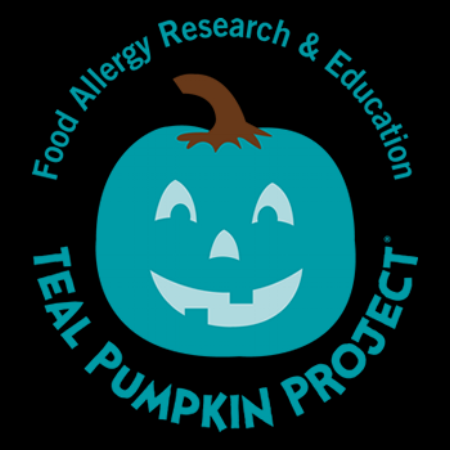 This is part of the Teal Pumpkin Project, something The Food Allergy Research & Education Organization started to spread awareness of food allergies. Having a Teal Pumpkin out signifies that your house has non-food treats for kids. Think themed pencils, glow sticks, bead necklaces, stickers, etc. Their website has a ton of ideas, AND a map to find homes near you that will have Teal Pumpkins/non-food items for kids. This is such an amazing way to include the MANY kids with a plethora of food allergies, not just dyes and artificial flavors. For school or friend parties, come prepared with dye-free pumpkin-shaped cookies. If you’re brave enough and feel like experimenting, you can make your own natural orange frosting using carrot juice or sweet potatoes. I’ve experimented a tiny bit with making my own food dye, but only beet juice to make pink so far. I typically just make my own frosting and then use dye-free sprinkles from Whole Foods. They’re kind of pricey, but they last a long time and the kids really love them. There are also several brands that make natural dye concentrate, which is something I plan on trying soon. Some popular brands of those are India Tree Natural Decorating Colors, Color Garden Pure Natural Food Colors, McCormick even has McCormick Color From Nature colors, which seem to get some of the best natural food dye reviews on Amazon. Keep in mind, most natural food dyes will make a lighter version than traditional artificial colors. Or you can keep your mixing bowls clean and go to Panera Bread and buy a yummy and all-natural pumpkin shaped cookie, complete with bright (but natural!) orange icing. 4. Make fun Halloween-themed food for their school lunch, like sandwiches cut into bat shapes with these super cute witches brooms made with pretzel sticks and string cheese. Or make this adorable veggie Skeleton for a Halloween party. It’s surprisingly easy to make your kids’ Halloween a dye-free one, you just have to adjust a few things. Homemade treats are great because you get to fully control what goes into them (pumpkin muffins/cupcakes with cream cheese frosting = delish! ), and there are SO many natural and yummy candy substitutes out there now. When we first started to remove dyes from our kids’ diets 3 years ago, there wasn’t a ton of readily-available candy out yet. Most were available online-only with outrageous shipping costs, and it was impossible to find holiday-themed versions. Last year there was more available, and this year I’ve honestly been amazed at how much fun, yummy, and cost-friendly options there are. Obviously, we don’t just let our kids eat all the candy they want whenever they want. We limit the amount of sugar and treats they have, but especially around holidays like Halloween, Valentine’s Day and Easter, it’s nice that they can participate and have yummy treats that are very similar to what their friends are having. If your family is dye-free, what are some of your family’s favorite goodies? If you’re new to the idea of removing dyes, what are some of the hardest things to give up that make it tough to make the switch? Follow us on Instagram @thefloralwreathblog, Twitter @ wreath_the, Facebook @ The Floral Wreath page, and Pinterest @ TheFloralWreath. Our Instagram shares far more behind-the-scenes looks at our lives.